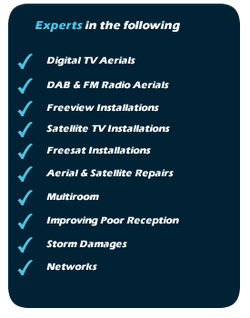 We can install your new Freeview-compatible digital aerial together with all the fittings and brackets required at an affordable price so that you can enjoy all that Freeview has to offer. In order to receive Freeview you need to have a digital compatible aerial. If you have bought a TV in the last 5 years there is a very good chance that Freeview is already built in. If you don’t have a digital compatible aerial then don’t worry, this is where we can help. We have access to the very latest digital aerial equipment and even if you are in a poor signal area, we are confident that we can help you.